Obama echoed the sentiments of a growing number of individuals who have criticized the insurance giant over the bonuses. Joining a wave of public anger, President Barack Obama blistered insurance giant AIG for "recklessness and greed" Monday and pledged to try to block it from handing its executives $165 million in bonuses after taking billions in federal bailout money. "How do they justify this outrage to the taxpayers who are keeping the company afloat?" Obama asked. "This isn't just a matter of dollars and cents. It's about our fundamental values." Obama aggressively joined other officials in criticizing American International Group, the company that is fast becoming the poster boy for Americans' bailout blues. The bonuses could contribute to a backlash against Washington that would make it tougher for Obama to ask Congress for more bailout help — and jeopardize other parts of the recovery agenda that is dominating the start of his presidency. Thus, the president and his top aides were working hard to distance themselves from the insurer's conduct, to contain possible political damage and to try to bolster public confidence in his administration's handling of the broader economic rescue effort. Obama had scheduled a speech Monday to announce new help for recession-pounded small businesses. But first, he said, he had a few words to say about AIG. He lost his voice at one point and ad-libbed, "Excuse me, I'm choked up with anger here." It was just a light aside, but he meant the sternness of his remarks to come through. "This is a corporation that finds itself in financial distress due to recklessness and greed," Obama declared. He said he had directed Treasury Secretary Timothy Geithner to "pursue every legal avenue to block these bonuses and make the American taxpayer whole." Later, White House spokesman Robert Gibbs said the administration would modify the terms of a pending $30 billion bailout installment for AIG to at least recoup the $165 million the bonuses represent. That wouldn't rescind the bonuses, just require AIG to account for them differently. Gibbs said the tough talk from Obama and other administration officials was aimed in part at pressuring bonus recipients to turn them down. Anyone accepting the money should "think long and hard" about whether keeping it was appropriate "given the performance of the company," he said. On a separate track, New York Attorney General Andrew Cuomo said Monday he would issue subpoenas for information on the bonuses after AIG missed his deadline for providing details. Cuomo said his office would investigate whether the employees were involved in AIG's near-collapse and whether the $165 million in bonus payments were fraudulent under state law. AIG spokeswoman Christina Pretto told The Associated Press, "We are in contact with the attorney general and will of course respond to his request." One reason that the AIG bonus giveaway is such a compelling story — and a politically troubling one for Obama if not neutralized — is that it offers a simple story line that appears to sum up ways in which the federal bailouts have gone awry. "This is just the kind of issue that galvanizes public outrage," said Paul C. Light, professor of public service at New York University. "It's always the tangible stuff, the things that ordinary Americans can relate to. They don't know the first thing about credit default swaps. But they do know about bonuses. And it's just the sort of thing that will undermine any future bailout activity." Bailout steps for AIG totaling over $170 billion since September have effectively left the federal government with an 80 percent stake in the faltering insurance giant. 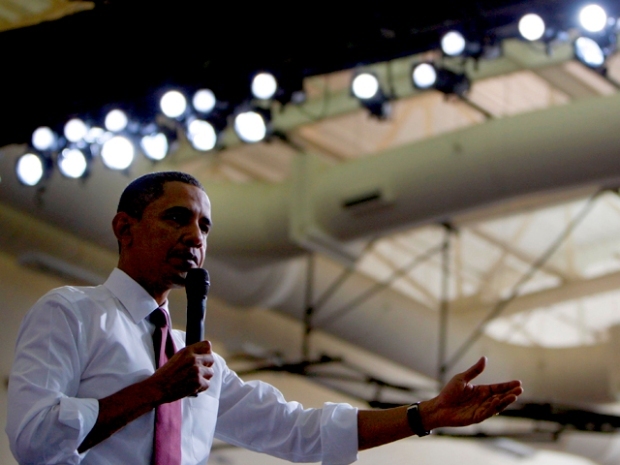 Obama's comments came on the same day a new poll showed slippage in his approval rating. The poll by the Pew Research Center showed it dropped from 64 percent in February to 59 percent this month amid divisions of opinions over his economic proposals and what the pollsters said was a growing perception that the president is listening more to his party's liberals than to its moderates. Andrew Kohut, Pew's director, said in an interview that people are most angry with banks and companies but there's also "pushback against Washington generally. And, of course, the buck stops with Barack Obama these days." Obama's sharp words continued an insistent administration drumbeat over the past few days designed to pressure the bonus recipients to forgo them. Thus far, American International Group officials have refused to rescind the payments. In a letter to Geithner over the weekend, the government-appointed chief executive of AIG, Edward Liddy, said the bonuses were legally binding obligations and the firm's "hands are tied." Still, pressure was building on that issue — and on the government to rework its AIG bailout to make sure the company repays as much of the $170 billion as possible. So far, the company has been honoring its contracts with U.S. and foreign banks, paying out more than $90 billion in economic bailout funds to big banks and others. The government agreed to uphold those contracts when it seized control of AIG in September, contending that failure would bring even worse global economic problems. However, Obama officials made the rounds of Sunday talk shows to denounce the insurer. And even Federal Reserve Chairman Ben Bernanke weighed in, saying on CBS' "60 Minutes" that the AIG bailout angered him the most and that he "slammed the phone more than a few times on discussing AIG." Still, he said a collapse of AIG would have wreaked havoc on the global economy. Obama was planning an appearance later in the week on Jay Leno's NBC talk show, perhaps to add a lighter touch to his efforts to show himself in command of efforts to resuscitate the economy. The AIG bonuses were revealed over the weekend. It also was disclosed that AIG used $90 billion-plus in federal aid to pay foreign and domestic banks, some of which had received their own multibillion-dollar U.S. government bailouts. The recipients included Goldman Sachs, at $12.9 billion, and three European banks — France's Societe Generale at $11.9 billion, Germany's Deutsche Bank at $11.8 billion, and Britain's Barclays PLC at $8.5 billion. Merrill Lynch, which also is undergoing federal scrutiny of its bonus plans and which is now part of Bank of America, had received $6.8 billion as of Dec. 31. The money went to banks to cover their losses on complex mortgage investments, as well as for collateral needed for other transactions. AIG reported this month that it had lost $61.7 billion for the fourth quarter of last year, the largest corporate loss in history. Outcries against the company have also come from congressional leaders. "I call upon the executives at AIG to right the wrong they have done to American taxpayers, who are footing the bill for the most expensive government rescue in history," House Speaker Nancy Pelosi, D-Calif., said Monday. Senate Republican Leader Mitch McConnell called the bonuses "appalling" and said he hoped "the administration gets the message from the taxpayers on this issue."